How long will Mexico’s oil reserves last? Mexico’s 3P (proven, probable and possible) reserves remained unchanged last year (2011) as new discoveries, mainly in the Chicontepec field, offset oil extraction. 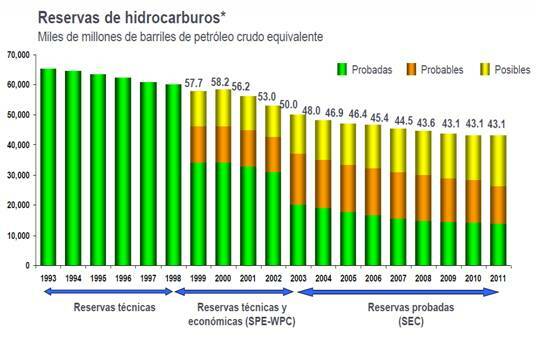 The Chicontepec field alone holds about 17,000 million barrels of oil equivalent (BOE), almost 40% of Mexico’s total 3P reserves of more than 43 million BOE (see graph). Mexico’s total 3P reserves are sufficient for about 32 years at current rates of extraction. Mexico has proven reserves of 13,810 million BOE, sufficient for 10.2 years. The size of these reserves compares favorably with proven reserves in the USA, which will last 11 years at current rates, or in the U.K. and Norway, where proven reserves will be exhausted within a decade. Two major earthquakes jolted western Mexico (11/12 April 2012) How much drugs money is laundered in Mexico each year?